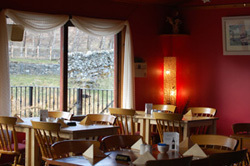 At the entrance to Cruachan is our licensed Coffee Shop and Restaurant. After your days activity or sightseeing come and enjoy coffee and drinks in a relaxed and friendly atmosphere. We also cater for large parties, please call to find out more and obtain sample menus. To book in advance please contact us on (01567) 820 700. 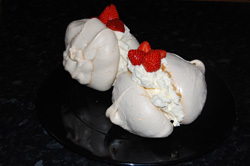 In our Restaurant you can enjoy home-baked Scones, Cakes and Cheesecakes. The meals are freshly prepared to order and our home cooked evening meals offer fresh Scottish Fayre - so please be patient, if you have to wait it will be well worth waiting for! If you are just in for lunch or something more substantial there is something to meet all tastes. Why not attend the Church Service at Morenish Chapel, this quaint Church is open the first Sunday in every month from May to October and then join the Church ladies for Tea and Scones in the Coffee Shop afterwards. Our licenced Bar has a very fine selection of Spirits, Bottled Beers, Ciders and Liquers. Our selection of Scottish Malts is second to none and we have a wide range of young Malts to the special 18 year olds. So whether you like a mild Malt or something a little more peaty like the Isla Malts we are sure there is something to fit your tastes. We also have a small gift shop in the far corner of our Restaurant where we have a fine selection of gifts and collectables available for sale. So, for those last minute holiday gifts why not see what we have to suit all ages and pockets. During the Summer and on Public Holidays, we would recommend you book at table at the Restaurant (especially on Saturday night) to avoid disappointment.